Dentists from DiBartola Dental, Drs. Wayne DiBartola and Tyler Porco, encourage teens and adults with dental anxiety to set up an appointment for a sedation dentistry examination. To help those individuals reduce their dental fear, the dentists offer safe, relaxing sedation dentistry in Bridgeville, PA.
One of the most requested types of sedation dentistry in Bridgeville, PA practiced by Drs. DiBartola and Porco is IV sedation, especially for serious cases of dental anxiety. Dr. DiBartola is a certified IV sedation dentist and is experienced in safely and effectively administering IV sedation to patients. Also known in some circles as “sleep dentistry”, IV sedation allows patients to relax and undergo non-invasive, minimally invasive, and invasive treatments as needed. Patients are always in control of their treatment plans and understand upfront what will occur during their sedation dentistry appointments. Other forms of sedation dentistry available at DiBartola Dental include nitrous oxide and oral sedation. When inhaled, nitrous oxide provides a sense of calm and enables patients to feel less concern without losing consciousness. Similarly, oral sedation involves taking medically prescribed pills while at the dentist’s office to calm nerves and provide a “twilight” relaxation that mimics the first moments of drowsiness. DiBartola Dental has been offering comprehensive dental care to their Bridgeville community for over 35 years. Drs. 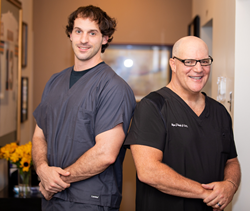 Wayne DiBartola and Tyler Porco combine a community-focused and compassionate view of dentistry with the latest techniques and technology the field has to offer. Enthusiastic about offering minimally invasive, relaxing and long-lasting care, this team is passionate about improving both a patients’ oral health and overall well-being. To learn more about Dr. DiBartola, Dr. Porco, their team or the services they offer, visit http://www.dentistbridgevillepa.com or call 412-221-9440 to schedule a personalized consultation.